This week I experienced a most unusual phenomena of not doing any training. Well, when I say a week of no training – I mean no training all week – excluding Mon, Tues and Saturday. To be honest, it would be easier to say I had three days off the bike. Though when I say off the bike – that obviously still includes cycling 10 miles into town and back every day. Never miss an opportunity to clock up miles – even when you’re not training, that’s my motto. So, to clarify, it was three days without any ‘proper’ training. It’s quite an interesting experience to suddenly have lots of free time to do things like er. visit a science museum and art gallery. Walking around town, thinking about going shopping, but not even having the enthusiasm for that. For the first day of no training, I had the odd anxious thought that my grand plans to do a bit more of the ‘long stuff in Summer 2016’ was taking a monumental and irreversible set-back. Winter miles missed in November and the long-term grand plan is already going out of the window. Fortunately, I had a sufficiently rational mind to realise that a day off in November, not only – doesn’t hold back goals for eight months hence – but may even do a bit of good. Recently a reader asked for any tips on good value winter cycle clothing. Over the years I’ve tested and used a huge variety of winter clothes – not always the best quality. These are some of the good options for staying relatively dry and warm in winter, without breaking the bank. I’ve never been inspired to spend a lot on winter clothing ( I waste my money on 70 gram saddles instead.) Though at this time of the year, I do often look rather wistfully at the well made winter jackets you can get these days. I’ve heard 50% of heat is lost through the head – I’m not sure if it’s this much. But, if it is less than 8 degrees I like to wear something under helmet, such as a thin skull cap to keep the heat in. I also like a skull cap that covers the ears. These can burn with cold otherwise. I have a Craft skull cap, which is very warm and breathable. (Craft at Wiggle) I also have a neoprene hat, but this had a tendency to be sweaty when not really cold. Some people tape up holes in their helmet – a cheap way of keeping more heat in. Not too difficult to take off rim with cold hands. Over the years, I’ve ridden several different tyres during winter. Primarily Continental Gatorskin and Continental 4 Seasons. Sometimes, I’ve gone into winter with lighter summer tyres still on, like the Gatorskin, Continental Grand Prix 4000. Sometimes I’ve gone to the other extreme and ridden really hard, heavy puncture resistance tyres like Specialized All Condition, but find these are just a bit too ‘heavy’ and slow – even though I never picked up a puncture with these tyres. Generally, it becomes a toss up between spending time mending punctures and being slowed down by heavier tyres. 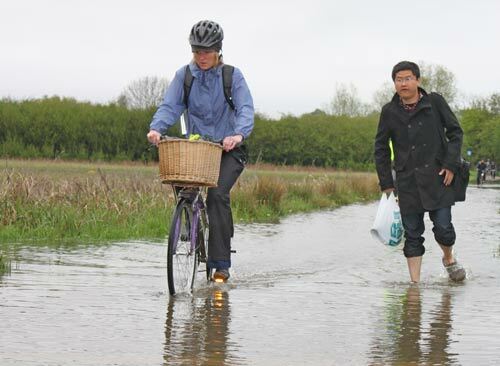 The good news is that even reasonably light and decent rolling resistance tyres are now fairly puncture resistant. There seems to have been improvement in tyre technology since I started cycling 20 years ago. Best size tyre for winter? For myself. 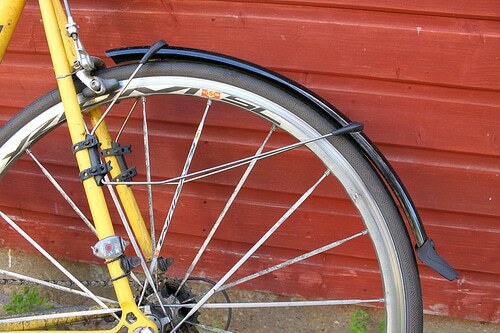 25″ is the new 23″ I’d strongly recommend 25″ in winter, especially for the rear tyre. I used to have this idea that the smaller the tyres the faster you go, but it’s more complicated than that. There is no discernible difference in speed between using 23 and 25, but you get a bit better grip. I’ve visited quite a few bike shops this week, and many road tyres seem to be 23″. But, for training, I prefer riding 25″ – especially in winter. 25″ will be perfectly fine for summer riding too. These are an excellent tyre. They last a long time, have one of the best puncture resistance and have reasonably rolling resistance. It’s everything that you want and need from a winter road bike tyre. I’ve only used one. But, it lasted a good 3,000 miles and I don’t remember getting a puncture. I’ve ordered another one for the rear wheel. It was 33% off which helped. The downside is that it is a bit on the heavy side, the smartguard puncture protection is fairly thick. It means the 25″ tyre weighs 380g (23″ weighs 340g) Compared to the Specialized All Condition it feels it has a little more spongyness, and a little better grip. Though heavy, they are not completely ‘dead’ and offer decent rolling resistance. Keep them well inflated, and you should get few punctures. The other downside is that, especially the first time, they are hard work putting on; they are very tight to the rim. But, once on you can almost forget about them for quite a while. I’ve used Gatoskin for the past couple of winters. They are relatively light for a winter training tyre, and good enough for summer training too. (23″ only 230 gram and 25″ 250gram) I’ve left the last pair on almost all year. They are quite flexible and a quite easy to fit. They are quite fast. However, I want to change them now winter is really setting in. They have been a bit slippy on recent rides. I got bad wheel spin on a climb to Brill (16%) and nearly skidded out on a damp corner. I might have been better off with a 25″ and it’s always slippy in winter. 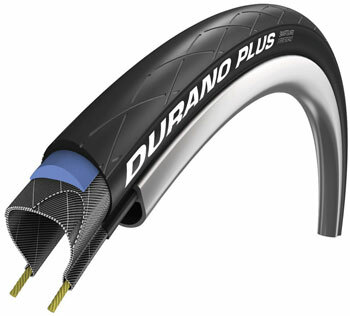 But, I’m going back to Durano Plus for my real mid winter tyre. Continental have also brought out a Gatorksin Hardshell. This adds an extra 48 gram to the tyre and adds an extra layer of puncture protection. 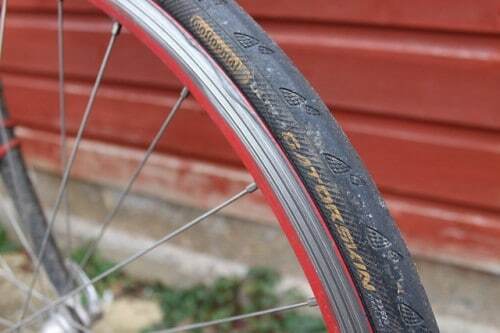 I’ve had one hardshell variety, and I couldn’t notice much difference in terms of rolling resistance, so the better puncture protection is good for winter. For winter, the Hardshell is definitely a good option. The Gatorskin are more of an all season tyre. At the end of the hill climb season, you finish with great top end form, but the less exciting, base aerobic fitness has been given a bit of a back seat. Late October is not the time to be getting 5 hour slow, steady rides under the belt. After a couple of quiet weeks, the top end form soon dissipates; or perhaps it’s just that you don’t have any motivation to see if you can still sprint up hills. Instead, my thoughts turn to all those miles I’ve been missing out on, and all the miles I need to be getting in. I was born in a frankly pre-historic, last millennium type analogue era. It was a time before heart rate monitors, power meters, Strava and all these notions of efficient training. I was brought into cycling on the traditional Sunday Club run. At the end of the 12 hour, 110 mile ride, you would just put your feet up and stuffed your face with food – there was no logging on to see how you were digitally comparing. The greatest excitement for measuring performance was the annual Cycling Weekly mileage double spreadsheet. I used to cut it out and put it on my wall. There was a simple target to fill in as many miles as you could. The more miles the better. This is what is now called ‘Old School Cycling‘ – but we were real men in those days, no indoor virtual races from the comfort of an internet connected roller ride. And I would rather Cycling Weekly kept publishing a paper mileage chart rather than these adverts for Ritmo – which, on principle I have no intention of ever trying to understand. Anyway, grumpy old man ‘things were better in my day’ complaint over. For no particular reason, I get to winter and generate a target to try and do 1,000 miles in each of the winter months – November, December, January and February. There is no good reason for this; no scientific basis that the key to a 4 minute hill climb in October is doing 4,000 miles in the preceding winter. But, it’s good to have a target, especially one where it doesn’t matter so much if you miss out a bit. To be honest, 1,000 miles a month does requires quite a lot of discipline – especially as the nights draw in and the weather turns remorselessly colder and wetter. I don’t think I’ve ever managed 4,000 miles for the four winter months, but I’m sure if I can do it this year, the 2015 hill climb season will be my best ever…. After two weeks of testing the waters – nothing more than the odd 32 mile ride (even if they did take 2 and half hours). Yesterday was chance to go out for a proper winter training ride. Five hours of plodding a lonely furrow through the Cotswolds. November 10th. I’ve never seen so my flowers still out. 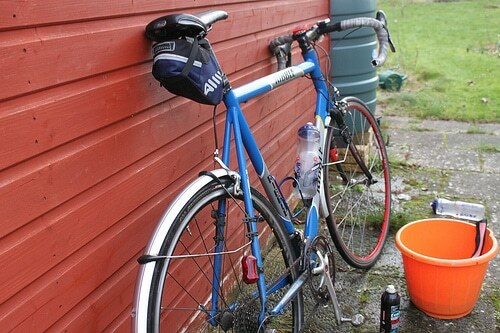 For the past four years, I’ve been using different types of SKS mudguards on my winter training bikes. Overall, I’m very pleased with the product. They do the main job of keeping the worst spray off your clothes. They are also quite easy to fit and adjust. They have also proved satisfactorily resilient. I bought these original SKS race blades about four or five years ago. I can’t remember how many years, but they are still going strong. After a few years, I once had a problem with the black supports coming away from the metal mudguard, but a bit of super-glue did the trick and they are still working on this Ribble. This came out about two years ago. I was sent a free review copy. I was pleased to get a free review copy because I probably would have been willing to buy. They are an improved version of the original race blades. They have better adjust ability and a bit longer protection at the end, with those clip on flaps. They look pretty elegant with a smart carbon finish. They are quick to fit on. No tools are needed. Just adjust with your hands. 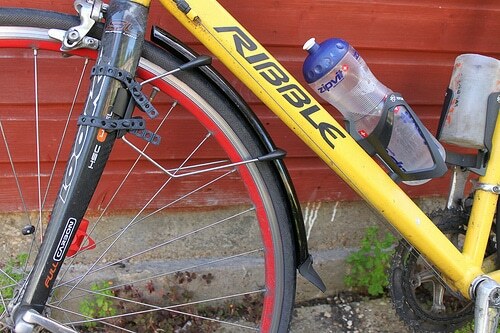 If they do rub, it is usually easy to fix by moving the different parts of the adjustable mudguards. You don’t have to take off brakes to fit. They are light only 250 grams, and are quite unobtrusive on the bike. They are quiet with no rattle, like I used to get on the old fashioned mudguards. They are like quick release wheels. It’s less than 30 seconds to take off, and perhaps a minute or two to fit on. Excellent if packing a bike up. They have proved quite robust. 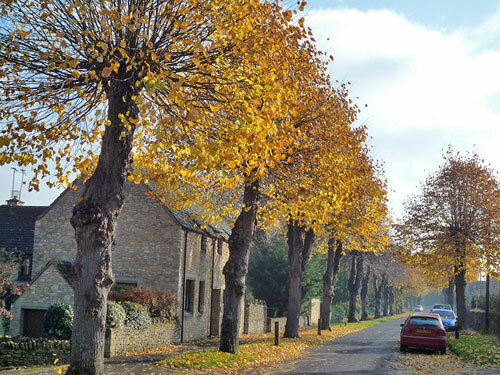 You can choose the wide road version or narrow road version depending on size of road tyres. The narrow are for 25″ and less. With a bit of fiddling, they fitted my unusually shaped forks on this Ribble. There is also quite a narrow clearance between wheel and frame on this bike. Though whether they fit all bikes, I’m not sure. Unlike traditional mudguards they don’t offer all round wheel protection. You get even more water and mud flying out by the rear brake, so it needs a bit of cleaning. 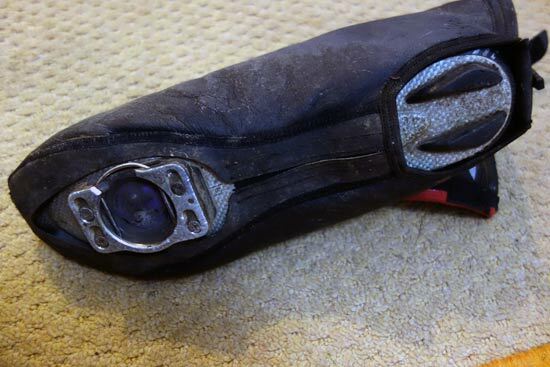 Review of the The Bontrager RXL waterproof overshoe. I’m always on the lookout for warm footwear and accessories. 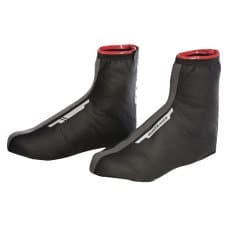 These Bontrager RXL overshoes looked very warm with a generous fleece lining. They also came recommended from Steve, the bike mechanic in BikeZone. Despite already having a pair of overshoes, I bought these. They cost £36, so I was hoping they would give an impressive performance to justify the price tag. Steve gave me a tip that he recommended erring on the side of getting a bigger size. He said the first pair he had were tight, restricting the blood flow and defeating the purpose of overshoes. I take shoe size 46.5, so I chose the XL size which says it fits 47-48. It proved a good fit for my Mavic cycling shoes – size 46.5. I’m sure it would be fine also for shoe size 47, but 48 might be a little on the tight side. Despite getting XL, it was a snug fit, and once on didn’t move. There is a good strong zip and it is well made. Underneath the shoe is designed for durability, with generous holes and no insulation. It means it won’t deteriorate walking around, but it doesn’t offer any insulation from the underneath. A complement to this shoe may be a lining of your shoe pad. 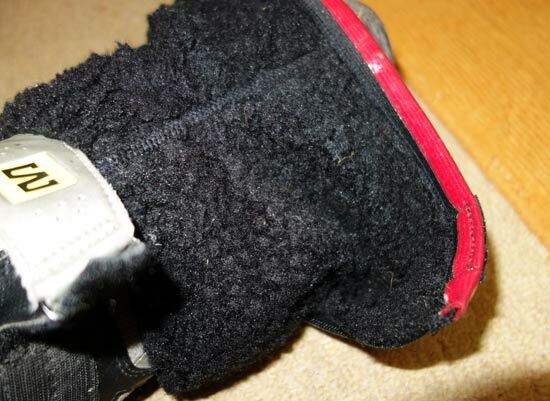 The main selling point for this overshoe was the generous fleece lining. It is warmer that most overshoes. My feet were quite warm at 10 degrees without the usual hotpads. These over shoes are ideal for really cold days. If you’re feet aren’t prone to the cold, these might even be a bit warm during spring and autumn, where it is a close call on whether to wear overshoes or not. If you don’t often get cold feet, you might be better off with a cheaper and slightly thinner overshoe. At £40, it really is quite an expensive overshoe. If you want maximum insulation for an overshoe, it is hard to beat this. For December, it is unseasonably mild up here in Yorkshire. I was lucky to have a free day, so I set off up Wharfedale for a five hour ride around Yorkshire. 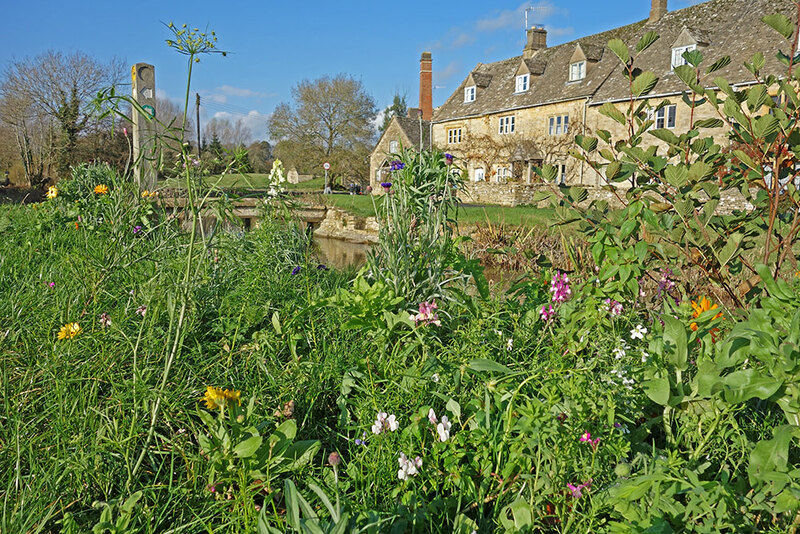 Once you get off the main roads, there’s very little traffic at this time of the year – the odd car, the occasional cyclist, and a few tractors spraying cow manure onto the road. It all makes for seasonal good cheer. At least I wasn’t wearing my white leg warmers. I was travelling up the B road from Grassington towards Kettlewell. I can report there are several trucks and workman creating the smoothest tarmac north of Dover. 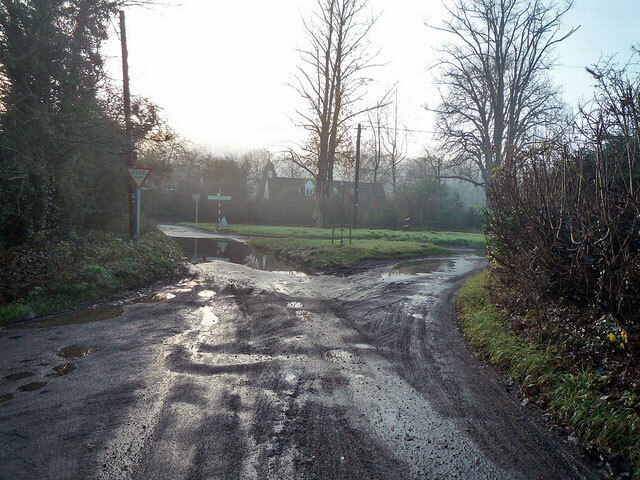 This newly found enthusiasm for filling in potholes must be either an unusual display of largesse and goodwill from Yorkshire County Council or perhaps there is just an important bicycle race arriving in a few months. I only wish the Tour de France could stay for a couple more days and go through every small road in Yorkshire, it could make it a cyclists’ heaven up here – if you didn’t have to fight puddles, mud and potholes. But, I suppose you can’t have everything. 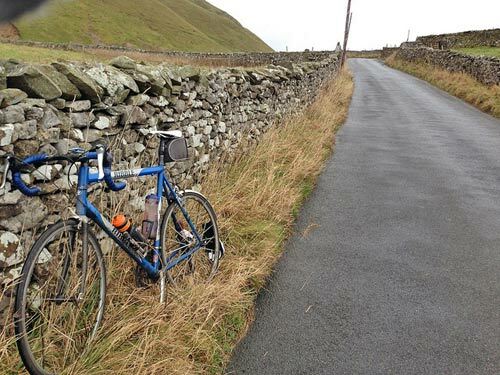 ‘Character building’, ‘ good practise for cyclo-cross’ I hear the spirit of Yorkshire saying – I guess it doesn’t matter as long as you’re getting the miles in. Just before Kettlewell I turned off the B road and headed towards Arncliffe and Lintondale. If it was quiet on the B roads, it was positively isolated on these roads. I didn’t even have a manure dispensing trailer to keep me company. I kept a decent tempo towards Halton Gill before turning left up a long steep hill into the wind. You get a marvellous view to your left and Pen Y Ghent looming over your right hand shoulder. The view made up for the depressingly slow progress into a stiff Westerley. As you descend towards Settle, another big fell, Ingleborough dominates the skyline to your right. It may be a little on the grey and damp side, but it’s spectacular scenery to be passing through. 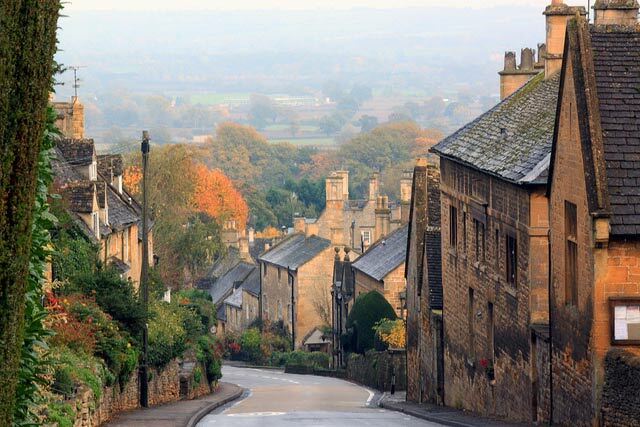 After the isolation and wilderness of the Yorkshire moors, down in Settle, there is a reconnection with the more usual pace of normal life. Trucks trundling along the A65 soon break the peace of being on the top of Silverdale with just sheep for company. 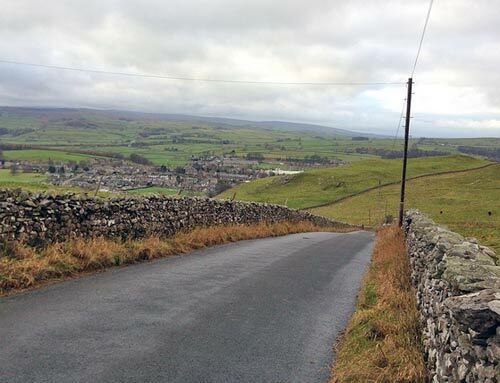 But, I didn’t have any stomach for riding on busy roads at the moment, instead I tried my luck turning left, up a sharp incline out of Settle to Scalebar Bridge. It was a strong tailwaind at this point, but it’s still a brute of a climb. There’s a section of pave before a really testing 18-20% grind out of the town. There’s little respite on the long climb, which is a shame, because you are afforded fantastic views if you look over your shoulder down into Settle. As hill climbing goes, I’m still in reasonably good shape, but if I hadn’t written my Christmas list already, I’d be adding a compact Chainset at the top of my list. It’s one thing to rattle up a 20% climb on your light summer bike, but when you’re weighed down my mudguards, several layers of clothes, and an excess of mince pies, you don’t feel quite ready for smashing up these climbs. It felt like pedalling squares – grinding away on my 39*25, wishing I had a lower gear to enable a more mid-winter, friendly cadence. Mind you later near Malham, I saw a classic old school rider churning away on his winter stead. He was fighting the roads of Yorkshire on a classic looking fixed bike. As I came to overtake him. I offered a bit of encouragement. It might be early December, but it’s always nice to get a century ride in. Cycling 100 miles in a day, is always a little bit of an achievement, even if you do race 25 times a year and ride 10,000 miles a year. The last time I managed to cycle 100 miles in a day was the National 100 mile TT back in July. It was up in the Lake District in the midst of a heatwave, I managed to complete the 100 miles in 3.46. I finished exhausted and dehydrated. Today, was just a bit slower (2.25 hour), and there was certainly no chance of heat stroke! November and December are very unstructured in terms of training. Basically I go out cycling whenever I feel like it. That generally means cycling quite a lot. I tried to make myself have a break after the national hill climb championship at the end of October. I managed a quiet two weeks before I got an itch to get on the bike, and for want of a better phrase ‘get the miles in’. Despite trying to have a break, I still managed nearly 900 miles in November, with quite a few 80 mile + rides thrown in. I could have made a few centuries in November, but the light fades pretty fast. 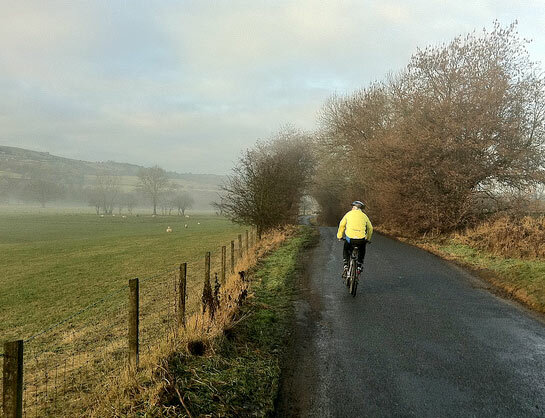 The biggest challenge to riding a century in deep mid winter is finding enough time in the day to complete the miles. You can’t dawdle for too long in the morning coffee shop if you want a 100 miles in December. 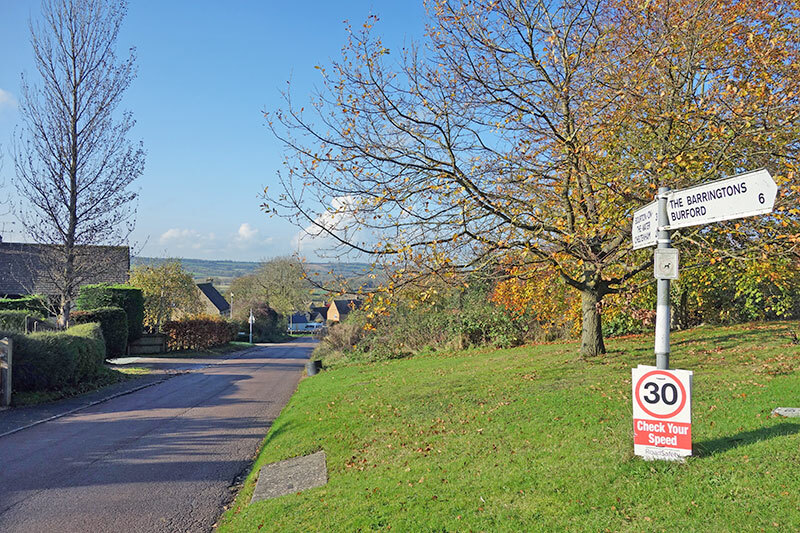 A few weeks ago, I went out to Bourton on the Hill with a dismally slow 15.7 mph average speed. Over 6 hours for 95 miles. Any other time of the year, I might have done a 5 mile circuit, but it was already on the dark side when I got home. At the moment, I’m not quite sure whether I’m training or just enjoying riding the bike. Even if I wasn’t doing any racing next year, I still think I’d be going out for a six hour bike ride. It’s a bit bonus if you can enjoy training for its own sake. I’m never entirely sure of the benefits of six hour long slow distance rides when you’re a hill climb specialist. But, although I’ve no qualifications in cycle coaching, I assume it’s better than sitting on the couch stuffing my face with maltesers. Winter training rides. 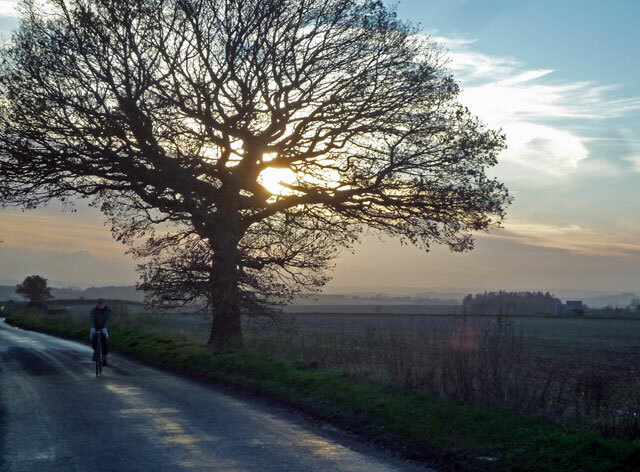 Do you see winter training rides as something to be endured – long slow miles in cold, wet weather or an opportunity to enjoy the rigours of the British winter and display you’re the Flanderian hard man of your local area? Do you’re winter training rides involve 30 minutes on the rollers once a week or will you clock up 250 miles per week, whatever the weather? After hill climb season of October, I’m actually quite keen to get on the bike and do some ‘normal’ cycling. The end of my season is very low mileage high intensity. If I’d done a 1,000 miles in October, I might feel like a break. But, in last few weeks, you’re not really on your bike that much anyway.